My latest video teaches you one of my favourite nail tech techniques - how to press glitter into gel polish! It's super simple and easy, but the outcome is incredible. None of these photos capture how brilliant this glitter shines in real life - I'm completely obsessed with this look. I was taught how to do this at the beginning of 2014, by a local salon. They thought it was funny that I can do crazy complicated nail art yet was completely blown away by this glitter - but seriously, it's amazing ☺. Here's the tutorial for it, hope you like it and please subscribe! The photo below gives a bit of an indication of how it shines, but it's still not the same as in person. When I had these nails on it was very distracting... I just wanted to stare at them all day! I used five different glitters for this design and created an ombre effect across my five fingers. Three of the colours were in little pots that I bought from Born Pretty Store, and two were in larger bottles. which the same store sent to me to review. When choosing glitter for this kind of work, make sure it's really small, otherwise it won't fill in the spaces properly. 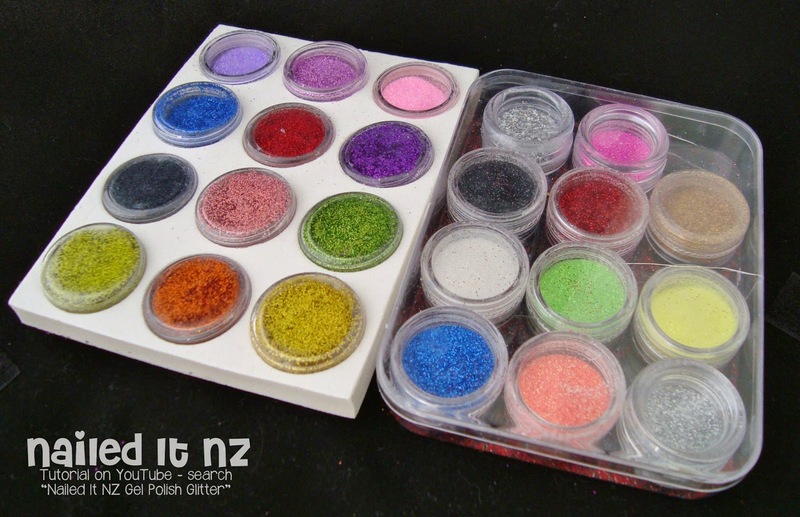 Here's a photo of all the pots of micro-glitter I have - bear in mind that they're not in the right order as I've had these for a while now and they've been used a fair bit. You can find them here, and here for a pretty decent price (free shipping too!). 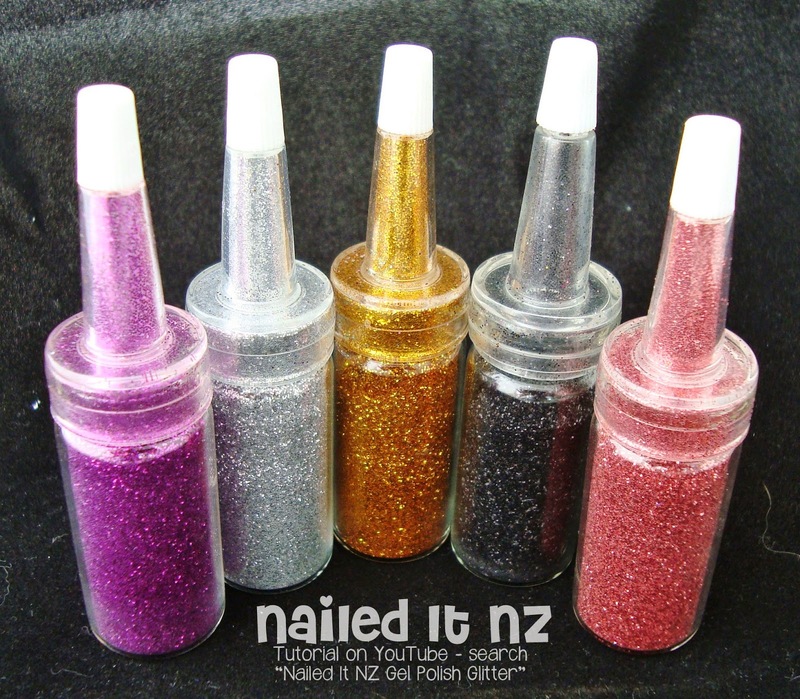 The glitters in the bigger bottles have a different finish than the pots, as I mentioned in the video. While the pots have a purely glittery, sparkly effect, these ones create a very metallic look, which you can see on the thumb and ring finger. I loved how the silver and purple came out on my nails! The black was pretty boring though; I used it in a previous manicure and it went matte - so you can barely notice it. I'm sure it'd be useful in other kinds of nail art, but for pressed gel polish glitter, nope. 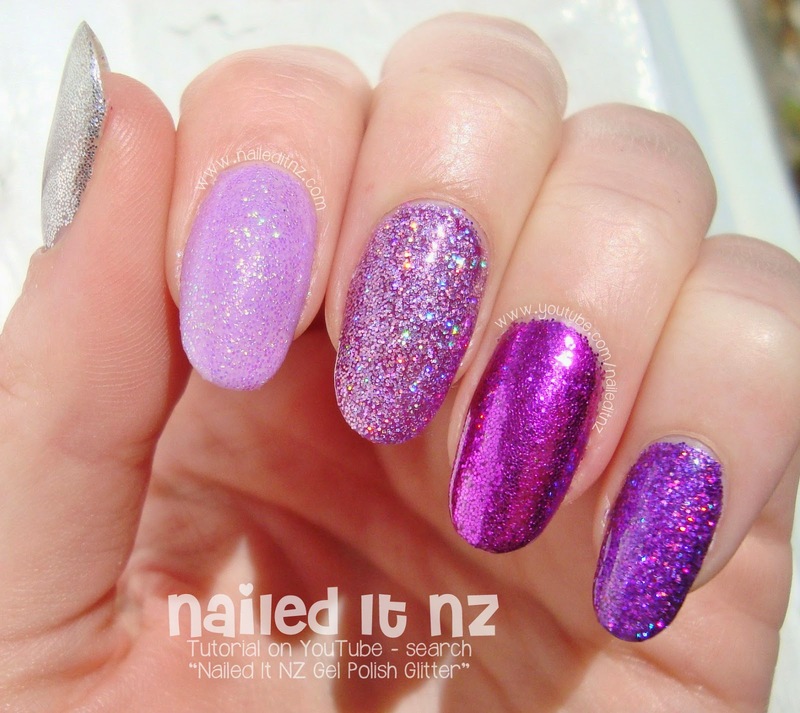 You can buy these metallic-effect glitters here. That reminds me; I visited the ECE centre my husband works at today and painted about 15 sets of 3-year-old's nails. So cute! Most of them requested "Frozen nails" - blue polish with blue glitter over the top. I put a picture up on facebook, here. Buy the pots of glitter here and here. Buy the bottles of glitter here. Use my discount code, CEL91 for 10% off at Born Pretty Store. Hope you love these as much as I do! I'm moving house in a couple of weeks time, and I think I'll do these again but in different colours to keep my nails safe during the move. Can't wait! Hope you're having a great day. They look so pretty! I don't do gel nails but it was still helpful to see and learn how to do it. Taylor Swift's Cats | Nail Art Celebrating 1989!